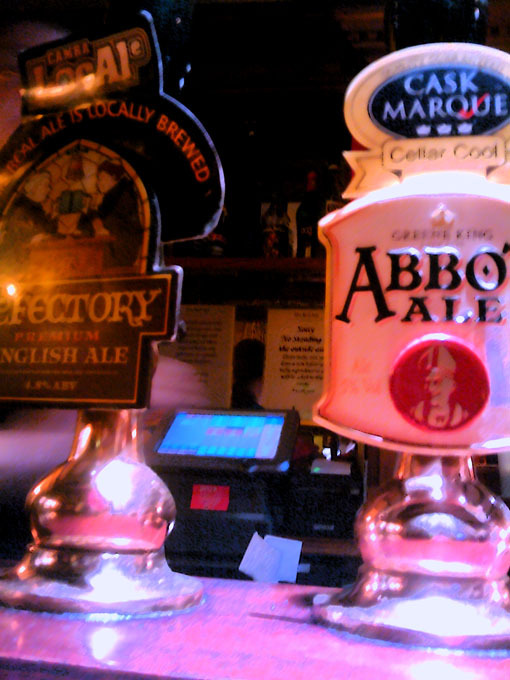 The other week at Get to the pub.com we looked at the news about cask ale increasing its market share for the first time in yonks. All the other coverage seemed universally upbeat, but I wasn’t convinced that a small increase in the share of a declining market was necessarily so great. This week the Cask Report has come out, and the gist is pretty similar. The headline figures look good; the context prompts second thoughts. And this time it’s the report’s own author, Pete Brown, who’s doing the “yes, but” thing. His blog post on the report is pretty much essential reading. Speaking of Camra and what have you, Get to the pub.com has received a copy of the 2011 Good Beer Guide, so we’ll be taking a closer look at that here very soon. If you’ve followed my personal Twitter thing @sparklepete, you might like to know that there’s a dedicated Get to the pub.com Twitter thing now as well. So please give @gettothepub a follow as well (or instead) if you like. Ta! Also, Sheffield-based readers might be interested to know that the Cremorne on London Road is undergoing “serious refurb activity”. Thanks to Richard for this information. I’ve gone from Saturday last week to Friday this week without getting to the pub. So when we roll up at the Rutland Arms at ten o’clock I’m gagging for some post-band practice lubrication and I’m breaking my longest pub duck this year. You know what they say: seven days without a pint makes one weak. I thank you. Happily for me, the Rutland is replete with the sort of luscious IPAs that damp down the flames of thirst with tasty efficiency. Gauging a night out by the amount you drink is a completely crass thing to do, of course. So it’s completely meaningless that I neck four pints in an hour and a half. All this band practice has been leading up to our spot at the Nottingham Indiepop Weekender. This being, nominally at least, a pub blog, I ought to refrain from banging on too much about the pop. And I ought to mention the Bunkers Hill barman with supernatural powers. Midway through the afternoon, outside the front of the pub, someone tells me the Harvest Pale is going cheap until six o’clock. Then I’m in and at the bar. “Harvest Pale?” asks the barman. Telepathic service. Can’t fault that. And then Sunday begins at the Bell (featured recently here at Get to the pub.com), where the indiepop bands and fans (as if there’s any meaningful distinction) start to gather for the day. We blink away hangovers and nibble at lunch among pints of an Abbeydale brew and a fine pale beer brewed specially for this pub. A jazz band parps incongruously on in the big room at the back. We move on to the Chameleon for the pop, where something strong and sharp made out of pears and cranberries becomes the first cider I ever drink in a pub. And I ought to persist in talk of good service, hoppy fragrances and interesting toilet tiles, but for this weekend the real significance of Bunkers Hill and the Chameleon is that they become the cradle of all our hopes, as dozens of the people I love, love, from all over England, crowd into these two places seeking sublime refuge from the million workaday fears and insecurities besetting us as outside our nation is cut to ribbons, and finding that sublime refuge, in every chord and every hug. Well, these places are pubs, and this is part of what pubs do. Long may they, and us, keep on doing it. The Ship and Shovel is a lovely place. We had a pub club there a few years ago, before pub club even existed. It’s split in to two bits, one kind of posh, the other shabbier – probably a bar and a lounge, like the Freedom House, but separated by an alleyway instead of a bar. Their website has a map of all their pubs – none north of Milton Keynes I’m afraid! I didn’t know The Bell was the place to be. I was in there on the Saturday, drinking the mild, hearing about how Geoff dressed up as a transsexual in Thailand. Bugger, I can’t sell my copy of Hops and Glory. Somebody went and wrote “To Woolpack Dave” inside it. If only he had put just “To Dave” there are loads of Daves…….